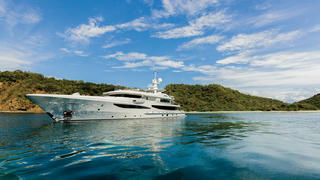 The 55 metre motor yacht Step One, listed for sale by Y.CO, has been sold with Camper & Nicholsons introducing the buyer. With naval architecture by Tim Heywood, she was built by Dutch yard Amels in steel and aluminium and delivered in 2012 as the yard's first Limited Editions 180 yacht. A custom interior by Laura Sessa utilises a colour palette that focuses on creams and whites, with maple wood and white onyx contrasted against black details. Accommodation is for up to 11 guests in five cabins including a master suite on the main deck, three doubles and a twin, all with en-suite bathroom facilities. The vast saloon is open plan with no sideboards to divide the space, and with large windows offering splendid views and plenty of natural light. Seating is to port while aft — in an area necessarily constricted by the technical ducting — a port-side bar makes the most of the space. The sundeck has been extended over the bridge coachroof to give an additional 32 square metres of deck space. The result, at 25 metres long and covering 155 square metres, is a vast top deck that certainly challenges all-comers for the title of biggest sundeck on a 55 metre yacht. The forward part offers daybeds with spectacular views, and this area also doubles as a touch-and-go helipad for a maximum take-off weight of 2,000 kilograms. Amidships is a 3,000-litre spa pool, while an al fresco dining table is nestled between the sweeping curves of the side coamings and shaded from the sun under the distinctive communications arch. Step One was asking €28,900,000.